80 Minutes of Regulation: The Band is On the Field! Wait, what? Hopefully by the time this posts, the NFL lockout will be over and we won't have to resort to this. It's an extended metaphor that's been a long time coming. You've probably heard me say before that trumpets are the marching band's wide receivers, referring largely to their (stereotypical) penchant for ego, braggadocio, and showboating. I've been playing a little bit with the idea of extending the metaphor into an entire team, and here you have it. It's worth noting that while the earlier statement was based on the personalities of the respective players, this is based more on their functions. If you find this absurd or question how this will work, read on! Also consider that different instruments, by their very tone, timbre, and the manner in which they are used convey certain imagery. It is the justification behind Prokofiev's Peter and the Wolf or Saint-Saens' Carnival of the Animals. By the same token, football positions have their respective roles and often the types of people--by size, skill, and personality--who play them. It just so broke out that the role of the offense is played by the brass and battery percussion, while the pit and woodwinds play defense. To the guard fans out there, it's likely no surprise that you're on special teams, but unfortunately, I didn't hash out different roles; as special teams play a variety of roles, so do guard members with a variety of equipment and skills. We'll start on the offensive side of the line of scrimmage. It should surprise no one that the action begins with the drum major, at center, setting the tempo and snapping it to the drumline (yes, the entire drumline) at quarterback, involved, as you'd expect, in every play. For those uneasy with the full battery in one position, consider the different looks and uses of the quarterback to be your instruments. Up front, large, solid, dependable, and low (be it in a three point stance or in pitch) the tubas play the offensive line. As stated before, the trumpets are wide receivers, but this time we're talking skillset, not just personality; their speed an agility leads to the ball often being in their hands for big plays. With a related skillset, the mellophones play the role of tight end; a little bigger and not necessarily as fast as the wide receivers, but able to block and share in the duties (long phrasing, for instance) of the offensive line. 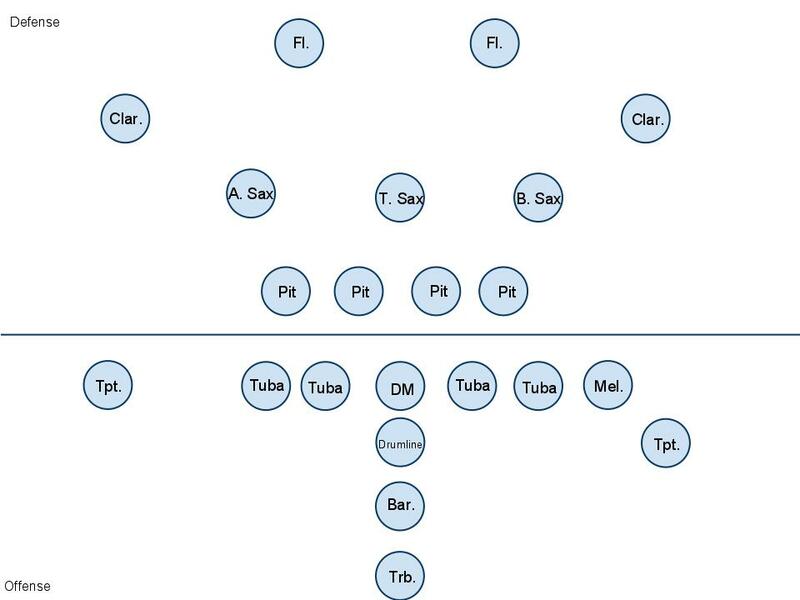 In the backfield, I've got some low brass in the running back positions; specifically, the baritones/euphoniums at fullback can assist in blocking, while the trombones are more likely to break free and pick up 15 or 20 yards. Let's cut over to defense. I'm using a 4-3 as the base set, though I'll talk a bit about other packages as well. Up front--where else would they be--we've got the pit. Based on size and roles, and using some fairly standard pit instrumentation, I'm putting timpani and bass drum/gong at the defensive tackle positions, while the speed and agility of the marimbas and xylophones will come off the end. Backing the line, we've got the saxophones; the tenor sax at middle linebacker will quarterback the defense, with the range to play in a deep center field role. At the strongside position, the baritone sax has the bass to shred the offensive line when needed, and a range equipped to take on the running back. The alto sax will play on the weakside; the range and agility allows for pass coverage matching up with wide receivers. If you follow both and have opinions on how I put the team together, I'd love to hear them! If you either follow football but not marching band or vice versa, consider this your Young Person's Guide to the Marching Band/Football Team. Hope you enjoyed!